Maine Vacations | Plan a Maine Vacation and Explore its Beauty. When planning a Maine Vacation our vendors will guide you with the resources you’ll need to plan your unforgettable experience in Maine. Whether you are exploring Maine during a vacation or you are looking for a quiet, relaxing retreat on the beach, you’ll can find the excitement or the serenity you need. What a great way to personalize your stay. Maine is also filled with charming tasty bakeries. Whatever the occasion, they have what your looking for, Wedding cakes, Anniversary cakes or just something special to take to a friends. One of the most important and memorable aspects of any event is the food. Make sure you hire a terrific Maine caterer to serve up a delicious meal to your guests. Lobster Bakes.. Looking for romantic wedding aboard one of our classic Maine Windjammers, Schooners or Catamarans? What a special way to celebrate your wedding or any special event? Want to leave a lasting impression of Maine with them? Looking for specific gift bags and favors that make the best gifts! Impress your guests with the ultimate giveaways. No wedding is complete without decorative, seasonal flowers to liven up the room. Having a Maine florist you will see & smell the beautiful arrangements throughout your venue. Plan the perfect Maine golf trip with your friends or family or travel alone and make new friends. Maine offers a wide range of accommodations to choose from, including elegant full-service resorts, hotels, charming bed-and-breakfasts and delightful cottage colonies. Hair and Nails for the big day? Maybe your bridesmaids & you are having a spa day? Maine has lots of choices for beauty & spa services. Getting ready for that big day? Looking for the unique jewelry store with great craftsmanship and service? You can find them in the town squares or the Maine Outlets. See professional rental services from tents to tables for your waterfront or home reception-party... Linens? Tents, Tables, Chairs,China, glassware? more..
You and your guests will have great sorting through the pictures/films finding those special moments even after your event, capturing timeless moments. 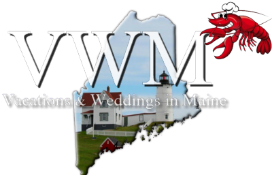 Make one of the most important days of your life memorable by having your wedding / reception in Maine! Choose a resort on a coastline, island, a sandy beach, or a lakeside lodge. Make your reception an event to remember. Rehearsal dinner is a special celebration, a time for your closest friends and family. Let our vendors help you find the venue for this intimate gathering of your closest friends and family, so you can celebrate in style. Maine is home to some of the freshest food in the world and the exciting nightlife. When it comes to food and dining in Maine, the restaurants ranging from elegant dining to creative sandwich shops. Don't forget about the Maine Lobsters! Travel agents get you from point A to point B. Your guests will appreciate the luxury & convenience of valet parking for your wedding. With limited parking availability at certain venues, this will help your guests save time and hassle. Adventures and activities that are only available during winter. If you live for the chilly thrill of winter sports, you'll love Maine. "Maine, the way life should be"
A Wedding Planner will make it easy to keep track of RSVPs, meal choices, seating and so much more.